There are hundreds if not thousands of Free Goal Setting Worksheets available out there. GoalSettingBasics.com provides the basic goal setting tools and worksheets so you can easily achieve the goal you set out to accomplish. It doesn’t matter if you make your own worksheet or you use one of our worksheets, the important thing is use one. Write out your goals, define them, prioritize them, list how you are going to accomplish them and by when. Put your plan into motion. We offer a collection of worksheets for you to use with setting your goals. From our basic goal setting worksheet to our exclusive F.A.C.E.F.E.A.R. goal setting worksheet. Fear is often a cause of failing to meet our goals. If we face fear, we stand a much better chance of conquering that fear and accomplishing our goals. Set goals for Financial, Attitude, Career, Education, Family, Exercise, Arts, and Recreation and you will be on course for great success. The SMART goal setting worksheet will help you in defining your goals as specific, measurable, attainable, realistic, and within timelines. If you are one for preparing for the next day the night before, make yourself a daily things to do list the the last thing you do before calling it a night. This will help you keep on track with the things you need to do meet your short term goals. Make sure to check them off as you go. You will find that not only will each check mark be a step closer to achieving your goal but you will get an incredible sense of satisfaction every time you check something off. 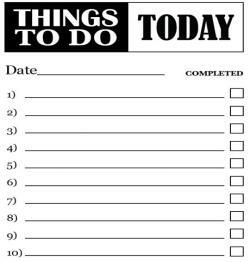 If it was one of those days and you tried your hardest to get it all checked off but just couldn't, no worries, just add it to tomorrow. If you live by making the effort every day, you will see progress. You will find financial goal setting worksheets for all occasions. Use one or all for short term, mid term and long term goals. Budget an upcoming vacation or a new car. Start the rainy day and retirement fund. What will be your projected income and how will you earn it. You should have financial goals starting today and for all days, weeks, months and years to follow. If you’re a kid with an allowance, a teenager landing your first job, or someone saving for a car, home, education, retirement, and life, there is a form for you too. Free goal setting worksheets also has budget worksheets. If you’re an employee or the boss of employees and are challenged with goal setting in the workplace, there is a worksheet for that. Setting goals will spell out exactly what the specific goals are, what needs to happen, what is expected and will ensure the highest level of productivity. If you own your own business, include the business goal setting worksheet with your statement of purpose, business outline, marketing and supporting documents and you have your business plan. Parents, get your kids of to a good start with goal setting worksheets for children, kids and teens. If they want something and you help them design a plan that will help them get it, they will feel a great sense of accomplishment and it's never too early to start setting goals. The student goal setting worksheet will help define what is expected from you and what you can expect from your studies. Goal setting will give a student long-term vision and short-term motivation. GoalSettingBasics.com offers Free goal setting worksheets for all. We will be constantly creating, adding and updating our free goal setting worksheets. If for what ever reason you do not see a worksheet that meets your needs, contact me with what it is you are looking for and I will check my library to see if I can find a match.